"As we ran out, they ran in." 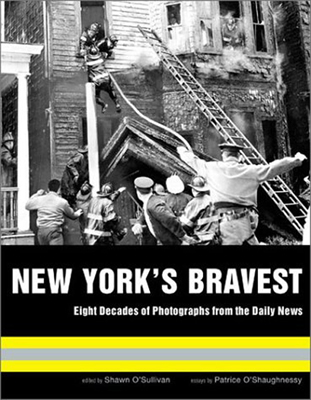 New York's Bravest; Eight Decades Of Photographs From The Daily News, a pictorial history of the FDNY. September 11 focused the world's attention on the bravery of New York's firefighters. As one woman so poignantly put it: "As we ran out, they ran in." These heroes were doing the job they do each day, protecting more than 8 million residents of New York City. That horrible day, we were heartbreakingly reminded of the risks these people take daily; risks their loved ones knew all too well. First-hand witnesses to the heroism of the FDNY, the photographers of The New York Daily News know the risks these heroes take every day. Daily News photographers have been covering the human drama of life and death situations since the News was founded in 1919. In over 6 million images Daily News photographers have preserved the history of children and animals being rescued from burning buildings, the despair on the faces of those gazing at the remnants of their lives, gone up in smoke. Daily News photographers know intimately the faces of those left behind in covering the all too many funerals, mourning with the families a loss felt not only across a city of millions, but acutely within a deeply bonded fraternity across the country and around the world. After the funerals of too many firefighters, the need to tell their story became obvious.The News' Shawn O'Sullivan and Patrice O'Shaughnessy formed a team of News employees to produce 'New York's Bravest.' Presenting the best photos from the Daily News archive, the book represents more than eighty years of the world renowned New York City Fire Department in action, fighting fires, rescuing lives, and bringing peace and order to chaos, fear, and destruction.